Wildlands has been out for several weeks now and I’ve had plenty of time to really get to grips with it, and to discover any issues or quirks. 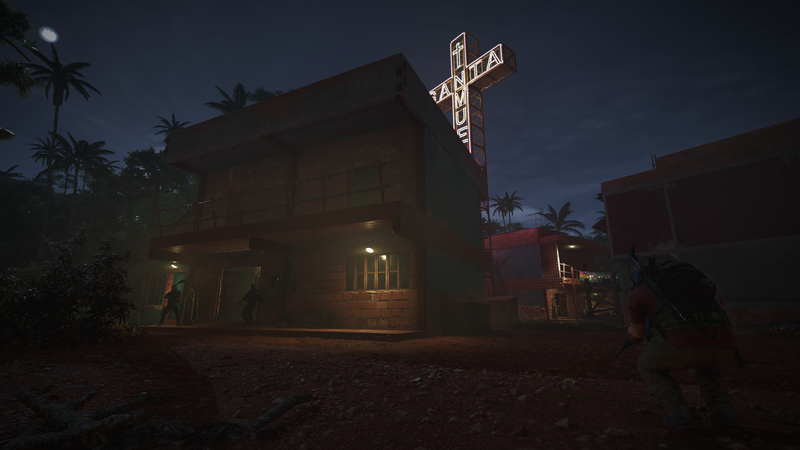 Set in Bolivia, despite complaints by the real Bolivian government due to Ubisoft’s fictional portrayal of the country, you’re thrust into the shoes of Ghost Recon – a collection of Special Forces folk with a penchant for ending lives, no matter the cost – and you’re tasked with bringing the resident drug cartel to their knees. Ubisoft have developed a knack for creating vast areas to explore and open skulls in, all while upgrading your gear to look the part in fashionable magnificence. They also have a knack for making these vast areas look superb. In terms of looks, Ubisoft have maintained their signature splendour with a simply enormous area that allows you to go about the task of expending ammunition on anyone with a Spanish accent. Stereotypes aside, the visuals are simply sublime, especially once you get out of the more dusty or tropical-esque areas and get to enjoy the view in the mountains, trudging through crisp, white snow. Enjoy walking? Me neither. Get a helicopter. The premise in Wildlands is simple: you and your team of A.I. hard asses are tasked with bringing down the cartel and helping out the local militia. In return you get some cool weapons and equipment, unique skins for a select few weapons and some unusual attire. Obviously, you can’t just walk up to the man at the top and relieve him of his brain. You have to take his business out piecemeal – one boss at a time. Thankfully, though, your enemies don’t have the difficulty levels like in The Division. Here’s they’re just regular humans, albeit with varied weapons and support. And often, a more covert approach is best, lest you incur the wrath of every man and his dog with an assault rifle in a 20 mile radius. Customisation seems to be all the rage nowadays. From the days of Halo 3 to the more recent Destiny, the ability to customise the look of your in-game self provides a degree of individuality in a world where most people play online. The Division provided plenty of customisation in terms of apparel and weaponry, and also catered for those wanting to earn additional clothing and weapons, much like Destiny. Wildlands follows on this tradition but has seriously gone to town with what you can choose. This means you can opt for a surprising amount of clothing and equipment for your chosen avatar. From tattoos to trousers, and body armour to bandanas, you can literally customise your chosen ‘black ops’ guy in almost any way, including opting for a cigar for that bespoke ‘A-Team’s Hannibal’ look. The only downside was the relatively small choice of facial types that were available. Almost all had that typical American JSOC/Navy Seal/Lumberjack look, complete with ‘Grizzly Adams’ beard. As previous Ghost Recon games have catered for several nationalities, I would have preferred an additional European approach and choosing someone more akin to the British SAS. But overall there’s quite a lot of options to choose from to set you apart from the crowd and that includes weapons traditionally used by other nations and all of those, barring the ones earned by taking out bosses, can be fully customised, and that includes the colour. The Cartel didn’t much like Stephen Hawking. The main appeal here is the ability to kit your guy out in whatever you want and then go to town on a somewhat unsuspecting encampment full of Cartel folk. If playing online with a group of friends it’s amazing how varied your choice of clothing and weapons can be. Some can be fairly typical in approach and all help to make you all look the part as a team. This can be having your designated sniper friend equipped with a powerful sniper rifle and a Ghillie-suit. Which looks pretty awesome as you sit there and watch him or her stalk their next target, slowly crawling into position before firing at a guard in a tower, while the rest of the team closes in and takes out other members of the enemy camp one at a time with silenced weapons. It’s pure wish fulfilment, which allows you to step into the shoes of the pseudo-black ops guy that is so often portrayed in so much of Tom Clancy’s writing. And is often mirrored elsewhere. The campaign can be enjoyed in single player, with three other A.I. controlled characters. Much of the campaign is fairly straightforward, such as head here and take out this group or this individual. But there are also side missions wish provide additional benefits and experience boosts, allowing you to unlock additional perks and equipment, or even weapons. 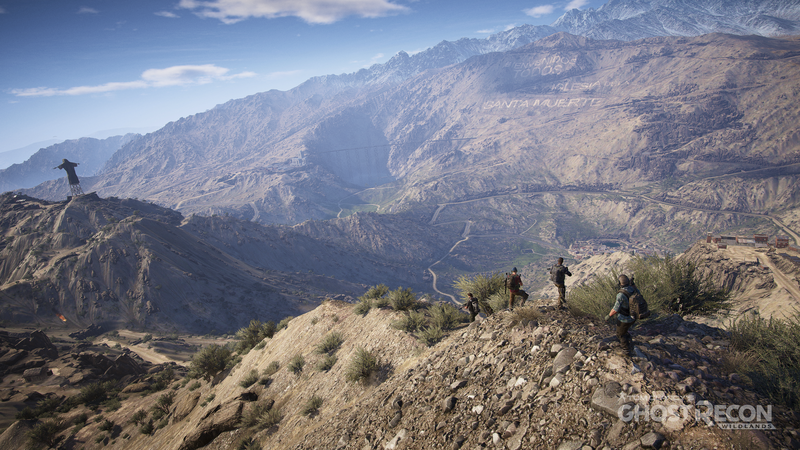 Wildlands provides plenty of variety in terms of environments to explore and use to your advantage. 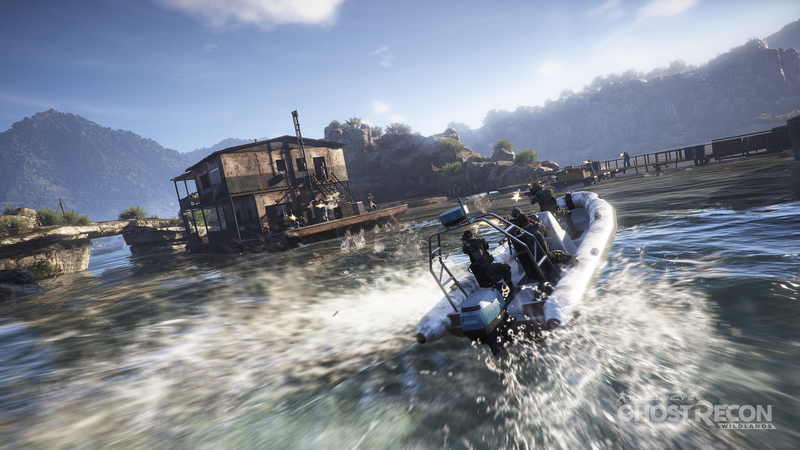 Though there is a lot of freedom in Wildlands, there are plenty of reminders for these side missions, but it’s far from being a nuisance and in some cases they keep you on track so you don’t get lost in exploring Bolivia. But the campaign is not a complicated matter. As previously mentioned, unlike The Division your advancement throughout the game doesn’t result in varied levels of enemy personnel. Everyone’s mortal here. There are no level 20 people to take out. Though even a high ranking team can find themselves overrun if they opt to throw any planning out the window, especially for the larger facilities that need to be cleared. The message here is that bullets hurt, regardless of who you are. That’s where multiplayer comes in. Though you’re A.I. controlled team mates can prove useful in the campaign, mainly because they never miss a shot. They are prone to moving up too far when getting into position, which often results in a compromised mission and a firefight you didn’t want this early on. Real human team mates, however, are the way to go here. A good squad that communicates can effectively slice through almost any Cartel positon without even revealing themselves. But if you opt for joining random squads via matchmaking this can be a varied experience, ranging from communicative people who know what they’re doing, to others who think they are playing Call of Duty and constantly throw grenades when they should really be opting for a silenced pistol. Or, more often, someone who has no idea how to operate a helicopter. The amount of crouching involved in this game would, in reality, result in some serious knee injuries. One session I played involved myself, another Brit, a French guy and an American. The French guy knew his stuff and had obviously played many of the missions, but when things went awry his response was to suggest that everyone kill themselves and start the mission again. I didn’t stick around too long. But get a good squad or play with friends and you can take anything apart in minutes, providing you plan accordingly. Overall, Wildlands is an enjoyable romp through the fictional, but beautiful, Bolivian countryside, with plenty to do and a lot of extras and upgrades to earn. The story is simple and straightforward, though lacks any personal connection or attachment, which has always been a problem for Ubisoft games. But despite the vastness of the game, there are moments where scenarios can become repetitive, but it’s a still a sound title that’s enjoyable to play.